Today was supposed to be grocery shopping day. But, we discovered a leaking faucet in the basement, and spent the better part of the day fixing said leaky faucet. That of course meant that we didn’t make it to the grocery store, and had to rely on one of our “go-to” meals. Everyone has those, right? They’re the meals you can throw together with whatever happens to be left in the cupboard or the fridge. Tonight’s meal was dahl with broccoli and rice. It’s quick, easy, and nutritious, and did not require a trip to the store. What more could we want? In a medium sauce pan, heat the oil. Fry the onions and mustard seeds until onions are beginning to brown and mustard seeds have popped. Remove the onions and seeds from the pan and set aside. In the same pan, mix the rest of the ingredients and simmer until lentils are soft (about 15 minutes). Mash lentils slightly. You want a stew-like consistency at the end. (Adjust water amounts depending on how dry your lentils are.) Stir in reserved onions. 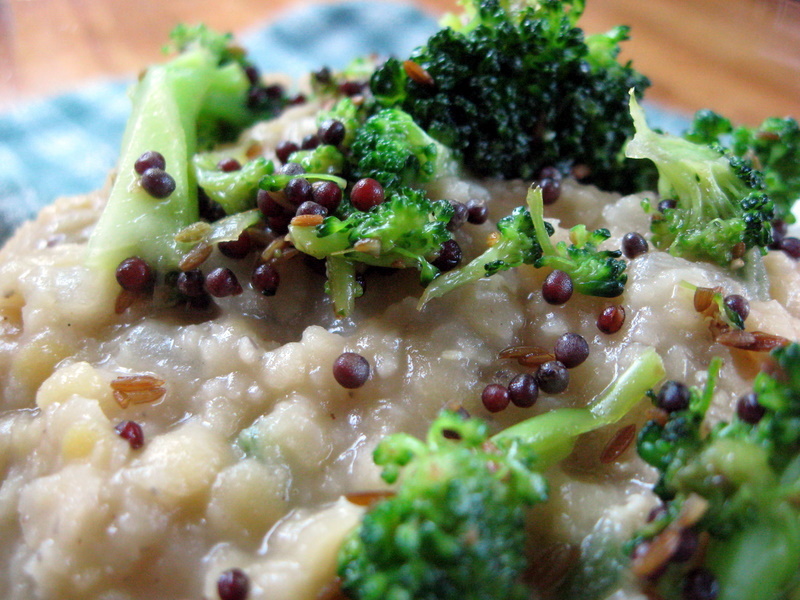 In a small pan, heat the oil cumin and mustard seeds until mustard seeds begin to pop. Add the broccoli and salt and sauté until crisp tender. You can use a little bit of water to help the broccoli along, if needed. This entry was posted in beans, broccoli, Indian, vegan. Bookmark the permalink. I love these kind of meals! I would have never thought to put dahl and broccoli together – what yummy flavors. I love your creativity!